So! As stated in previous posts, my night at Hapuna Beach was great, except for the EPIC wind that blew through my cabin and did not let me get much sleep! It was 4:32am in the cabin at Hapuna beach. I was trying to sleep but I was getting demolished by the wind. I am very thankful that I was in a wooden building and not a tent. Not sure a tent would hold up. The national weather service described the conditions as “barking sand” or “Kekaha.” The wind first started at 1:35am. I got up relatively early to start my day since it was going to be a long one and a long one it was! There were several other families that were staying in other cabins at Hapuna Beach State park and one of them was the Teehee family. They were originally from the Philippines and now reside in Volcano, Big Island. For those of you that know me personally, you know how important breakfast is to me and how I cannot start my day without it. I thought for a second and responded, “Well…maybe I can stick around.” Great decision! They made orange, banana, papaya smoothies and pancakes! Damn! That blows my lame bagel, peanut butter and honey out of the water! The smoothie was soooooo good! wow! The pancakes had bananna’s and orange in them too! I was really grateful! We exchanged a few other words about what they like to do and life in Volcano ect. I looked at the time and it was 8am. I needed to hit the road. I loaded my things, looked the bike over, lubbed the chain and started turning the pedals. 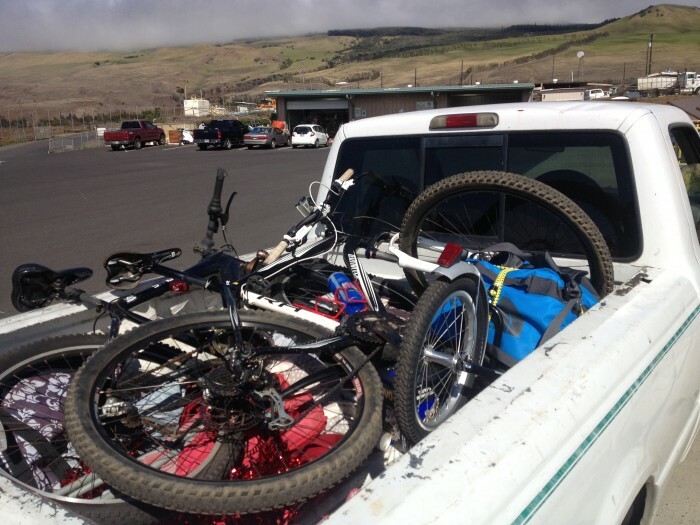 When I first arrived to Kona, I took a taxi to the bike shop. The taxi driver was also from the Philippines and I told him what my plans were. I tried to get as much info about the roads as I could. 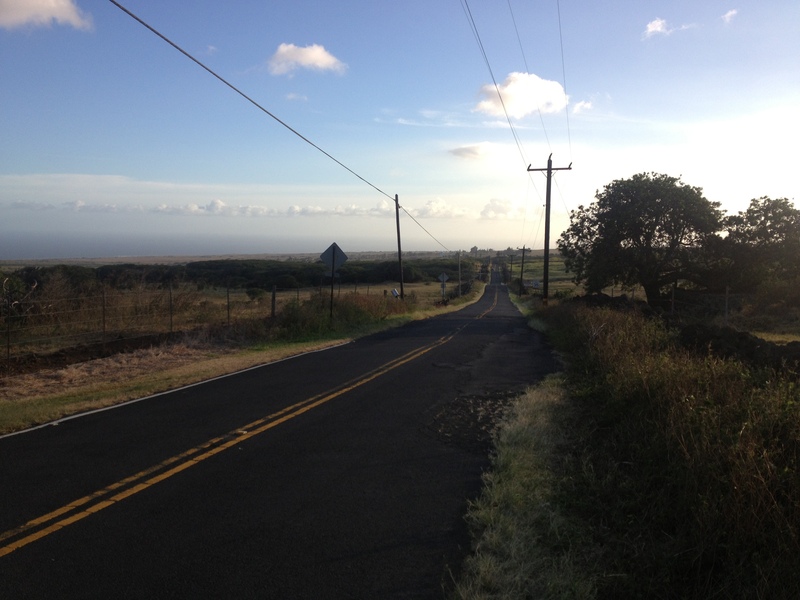 “How is the road to Waimea?” The taxi driver responded, “You are biking up the road to Waimea?!?! Brah! That is a steep hill with little shoulder!” I thought well, I have biked up some ridiculous hills and thought that he might be describing the hill more dramatically than it actually is. Well… I learned never to underestimate the locals because that hill was insane! 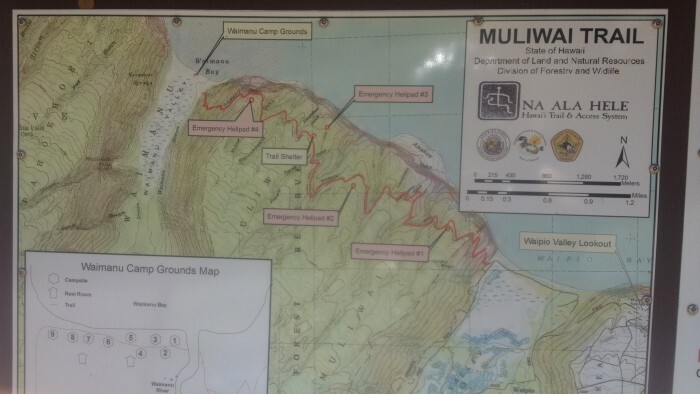 It starts about 1 mile from Hapuna Beach. There is a “Y” in the road and you make a right and start climbing! Remember the EPIC WIND that I had the night earlier, yeah well it was still howling. Guess what direction it was going?!?! Yep! You are right! In my face while biking uphill! I have no problems with hills even while pulling a trailer with my things nor do I have a problem with the wind but when you combine the two, it makes for some unpleasant riding! Now, I reminded myself, “Nathan! You signed up for this and you are on vacation. Right… vacation…” It was sweet. 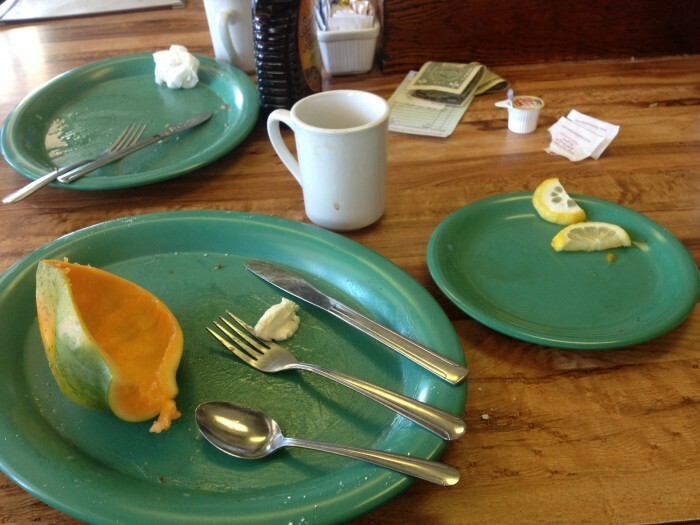 I turned it into a sick mind game trying to climb the hill, jamming out to Macklemore and Ryan Lewis (Thank you Pandora and 4g) and imagining the epic breakfast that awaited me at the top at the Hawaiian Cafe. The hill starts with a mellow grade and ample shoulder. Then the shoulder turns into being 4ft wide with cars whizzing by at 50mph. Now, the wind started gusting and throwing me all over the place. My whole upper body was really tense as I focused on keeping the bike in a straight line. There were elevation markers, 500ft…1000ft….1500ft…2000ft. I was climbing and thinking, “how much higher do I need to climb?!? !” There was no end in sight. Finally, the gusts forced me off my bike. The wind was literally causing me to stop and having to dismount. I have experienced this only one other time on a ride in northern Alaska on the North Slope. I decide to take a break on the side of the road. I take out my phone and look at the map. How much further do I have to go? 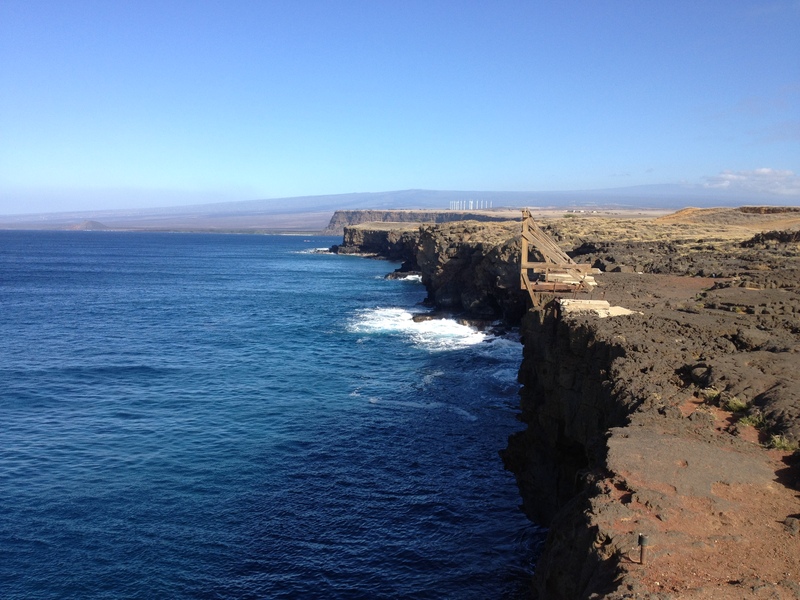 I’m 6 miles from Waimea… It is insanely windy. Gusts 50-60mph. The wind is throwing me off my bike. I’m having to walk for fear of falling into the road. I’d rather be at the beach. Maybe I should just push my bike??? That would be a lot safer. This wind is not slowing down anytime soon. I put my bike in the back of his truck along with my trailer. (I leave my helmet behind..unknowingly) He opens the passenger door and it violently swings open. I have to slam it shut. Whew! “The wind is crazy,” I exclaim. The driver’s name is Dave. He is a local but has roots in Alaska and is very knowledgeable about the local area. We drive up the road and he tells me that he tried passing a car earlier but could not since the wind was sooo hard! He asks where I want to go and I ask if there are any local breakfast eateries. He takes me to the Hawaiian Cafe. I get three french toast slices and a coffee. Dave joins me for breakfast and he tells me a bunch of other stories relating to his life and the local area. Afterwords, we cruise through the other end of town (10 min). He pulls off the road and I get out of the car. I realize that I left my helmet where he picked me up! Dang it! I feel pretty dumb. Dave, “Are you sure that you left it there and not at the cafe?” Yeah, I respond. He offers to drive me back and get the helmet. Dave, “You can’t bike without your helmet!” I agreed and we went back and got it and then he dropped me off in the middle of town. I offered him $20 bucks for driving me around. He politely declined and said, “I’ll take half that.” Great! “You picked me up at a great time!” I was really glad that I ran into Dave! Next! I needed to bike to Honoka. 15 miles in the wind but mostly downhill. What goes up must go down. I was really surprised at the strength of the wind and how consistent it was. 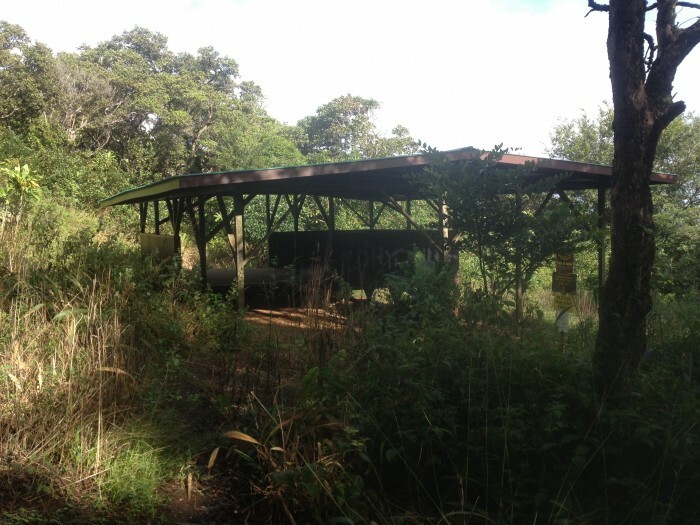 Following Waimea, there are mostly residential communities and ranch land. I arrive to Honokaa at 1:30pm-ish. 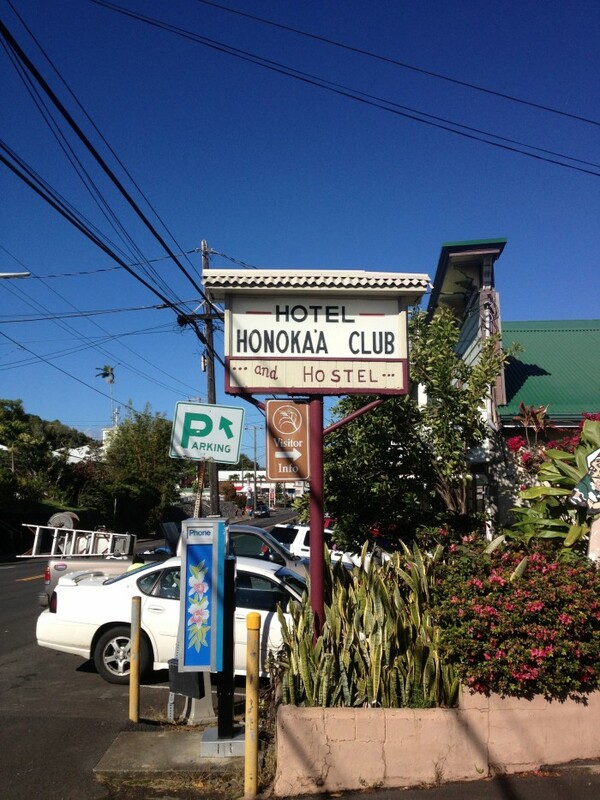 I go to Honokaa Club Hotel/Hostel. I want to stash extra gear there that I do not need for the hike. Anile, the owner, is very welcoming and very open to letting me leave my stuff there while I hike. It costs $5 to leave my stuff but that is fine. 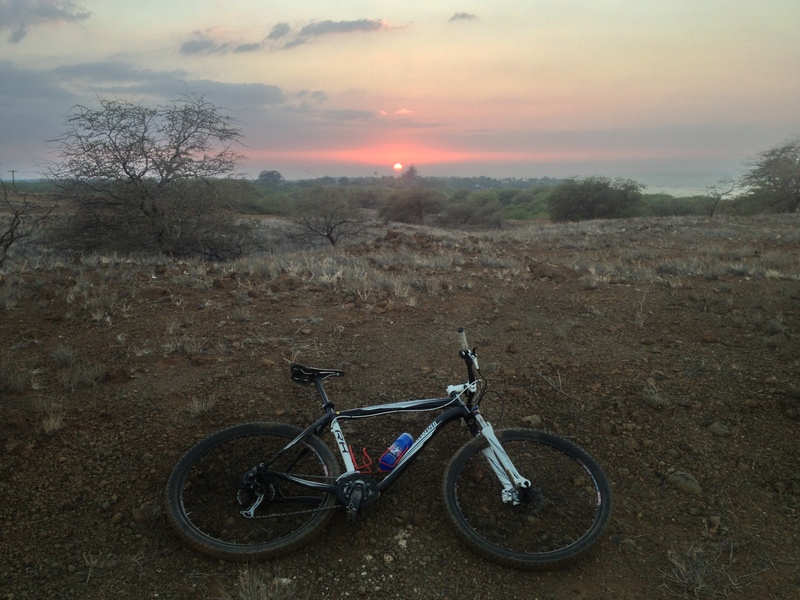 Time is ticking… I still need to bike 9 miles to Waipao lookout and hike 9 miles to the Waimanu valley. The sun sets around 6:30 so I have 4.5 hours left in the day. Plus! I need to get some food. I stop at “Sack and Save” the local grocery store. I buy two sandwiches, trail-mix and three candy bars, “Paydays!” Alright! It is time to move! I make it to Waipao lookout by 3pm. The road there is mellow and there is no head wind! I descend the 4×4 trail that is 20-25 degrees in steepness. I’m riding the brakes the whole time! I get to the bottom of the valley and take the trail/road to the beach. I stash my bike and trailer in the woods and change into my hiking clothes. I start hiking and have to cross a small stream. I walk along the beach to the start of the “Z” trail. A 1500ft climb of zigzags to the top of the ridge. Two people at the bottom say, “welcome to the Z trail.” I start climbing. Up, up, up we go. 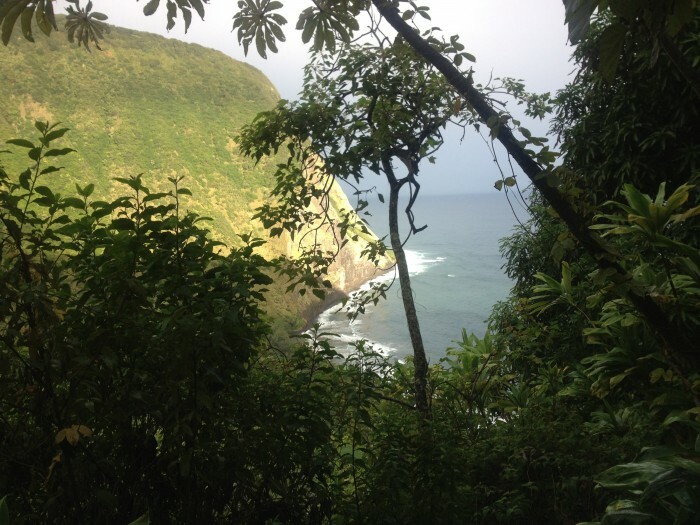 The view of the Waipao valley is great! I remember that I am pressed for time and keep cruising. The trail goes into deep valleys and then out; over and over again. Each time I was thinking, alright Waimanu Valley is after this next bend. 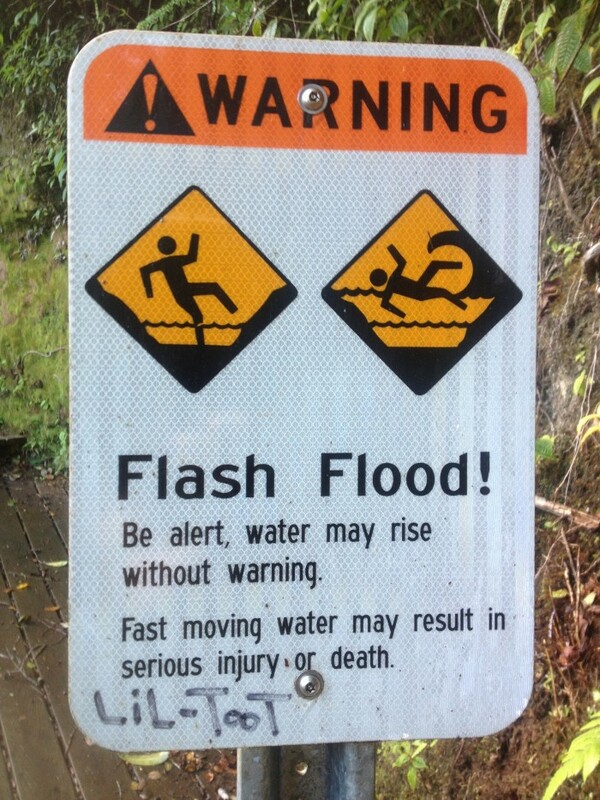 I kept passing, “flash flood” signs. That was really scary to think about. I have backpacked in the Grand Canyon and you have to be aware of that as well. There are four emergency helicopter pads that you pass. I later found out that people have been evacuated from there for various reasons. About half way on the trail there is a metal roofed shelter on the side of the trail, other then that there are no other shelters. The time continues to pass by. It is getting darker and it is hard to know exactly where I am. Should I set-up camp and continue in the morning? No. I want to make it to the valley tonight! Finally, Im at the top of the valley but there is a steep descent. I need to get my headlamp. The trail is slippery and wet plus there is debris such as leaves which make descent more difficult. I fall on the trail several times even with shoes that have good traction. At the bottom, the trail flattens out and I can hear the ocean. It is pitch dark. All I can see is what my headlamp provides for me. There is another river crossing with a rope tied across it. I take my shoes off and walk across with the hand line as an aid. The crossing is not too bad but deeper then I thought it would be. I scope out a campsite. There are rock walls that have been constructed for tents to protect from the wind. I take advantage of that and set-up my tent, although I leave my rainfly off. I eat some food, drink some water and go to bed. I look up and can see the stars! I fall asleep. I wake up later and cannot see the stars. I think, “it’s going to rain!” I quickly get up and put a rain fly on my tent. I get back in the tent and feel better. Then it starts to rain… It pours!!! For the rest of the night. I think about leaving and hitting the trail for fear of floods. I stay in my tent. I do not get much sleep. Sounds like another amazing adventure! Cheers! !